An air of excited anticipation hung over the expedition party as we assembled in Nottingham to begin our long journey to the Atlas Mountains in Morocco. The group comprised of twelve students and two instructors from Northumbrian and East Midlands Officer Training Corps. 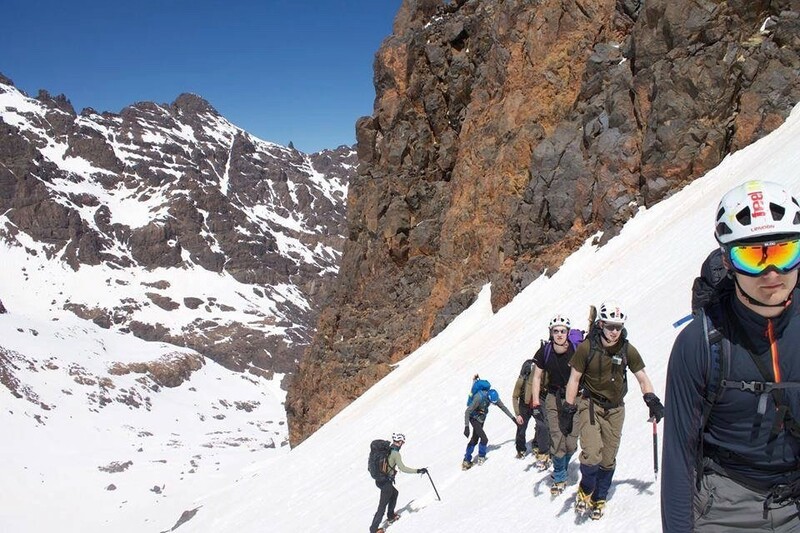 Our aim was to summit Jebel Toubkal in winter conditions. At a height of nearly 4200m this would be the first time most of the team had experienced the lack of oxygen and potential for Altitude Sickness. Although everyone was brimming with the inevitable buzz that an overseas expedition always brings, nerves abound as this trip represented the first opportunity for the students to practice the skills that they had been developing for the last year. 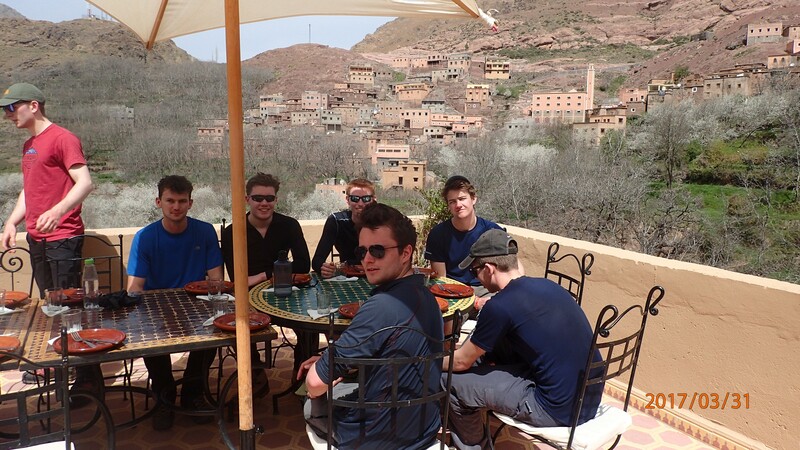 For most of the team it was their first exposure to mountaineering at high altitude and also their first visit to Morocco. 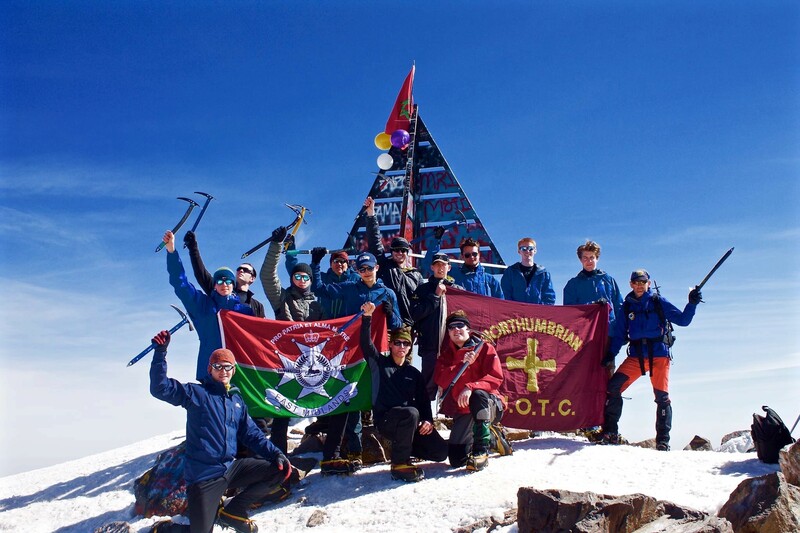 As pre-training all the team had completed the Summer Mountain Foundation course and most had completed a summer trek in either Corsica or Yosemite. The team had then all come together in January for the final part of the training to complete the Winter Mountain Foundation course in the Cairngorms. After a night of introductions, health and altitude briefings, kit issue and fitting, and administration the team got a few hours shut eye before setting off to Gatwick in the morning. After an uneventful flight we arrived in Marrakech just as it got dark, and loaded up into a minibus for a two hour drive to Imlil where we would shake out for a couple of days before heading higher up to a mountain refuge. 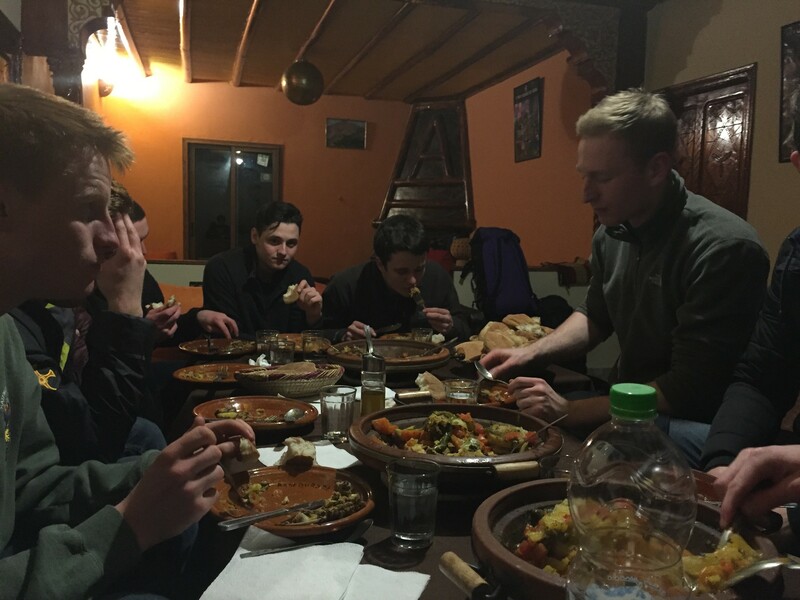 We arrived at the Riad, tired and hungry to be met with a typically friendly Berber welcome, and a feast of a meal with the first of many tagines (the local Moroccan dish). We were awakened early next morning with the first of many calls to prayer from the local mosque, and then a hearty breakfast. Acclimatisation was the watchword of the day. To this end the team conducted a preparation trek to the summit of a near hill in order to test out our boots and rucksacks. Whilst purchasing supplies we were invited into a shop for some Berber whisky (no alcohol unfortunately – just the name for the local mint tea). 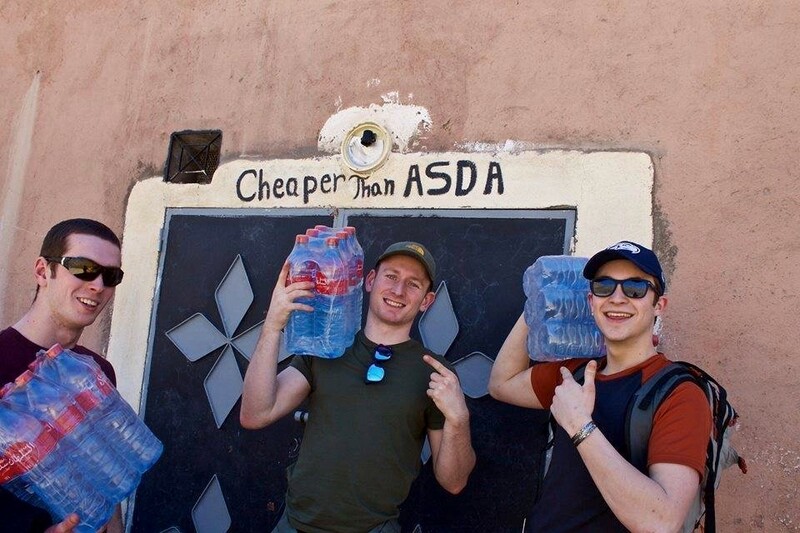 This was followed by a well-practiced sales pitch, which resulted in the purchase of some local clothing by the team – after the inevitable haggle! 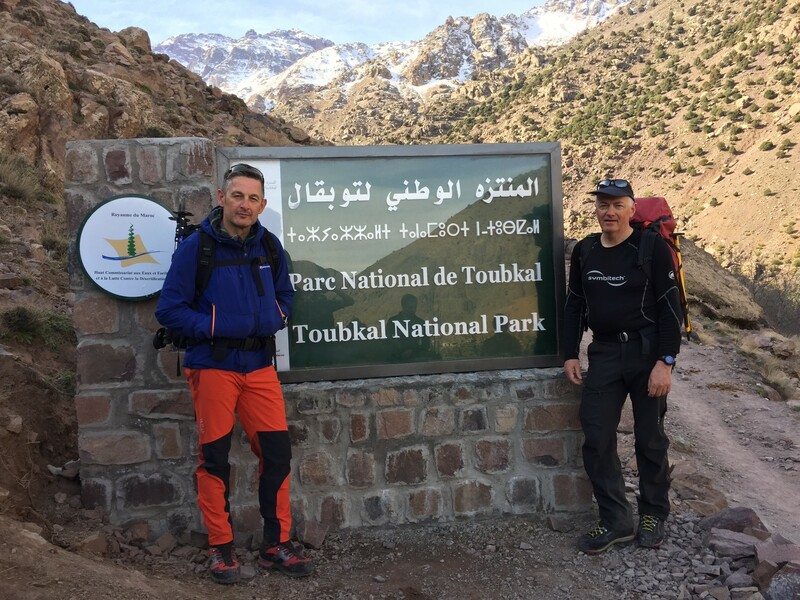 The following day we began the long 1500m of ascent up to the refuge situated in a small valley within striking distance of our ultimate goal – the summit of Mount Toubkal. Initially the path took us through small villages and cultivated plots with blossoming fruit trees and then in to more open ground with sparse vegetation. Mules were carrying the majority of our gear until we got up to the snow line, beyond which we carried all our kit. Now feeling the effects of the altitude and with heavy packs our pace slowed for the last 3km to the refuge. Two days of acclimatisation and snow craft revision followed which allowed our bodies to adjust to thin air before the summit day. We set off earlier than usual in order to avoid ascending during the heat of the day and quickly found ourselves in a race against the rising sun to stay in the shade. The weather had been kind to us with clear skies and the high summit winds had now dropped to almost nothing. Thanks to the training and acclimatisation that we had all undergone we made steady progress upwards on the frozen snow. Breaking only to reapply sun cream and take on water we found ourselves at the summit sooner than we expected. It was here that we were able to first take stock of what we as individuals and as a group had achieved. In less than four months us students had gone from complete novices on snow to accomplished winter mountaineers and our instructors had led us along this journey of discovery. The initial care that she got from you and your team was exceptional and it would have been much worse without you guys! She’s fine now and walking around on crutches. Nothing seems difficult after the 5-hour mule evacuation, which was a real challenge. We can’t thank you enough for all your help! The following morning, with the momentous events of the previous day still fresh in the mind, we began our descent back to Imlil. The scenery was the stuff of poetry as the sun’s rays lapped the sides of the mountains and illuminated every crack and crevice they possessed. No mules this time so we really appreciated lunch waiting for us at Imlil containing all the local delicacies that the Atlas Mountains possess on a terrace overlooking the village. From here we drove to Marrakech to a small hotel in the centre of the old town. Dinner was served on a roof terrace overlooking the main square, gazing at the everyday hustle and bustle of Marrakech. We reflected on our achievements; certainly a hard physical challenge at altitude, a new confidence in our developing skills on snow and our personal administration. 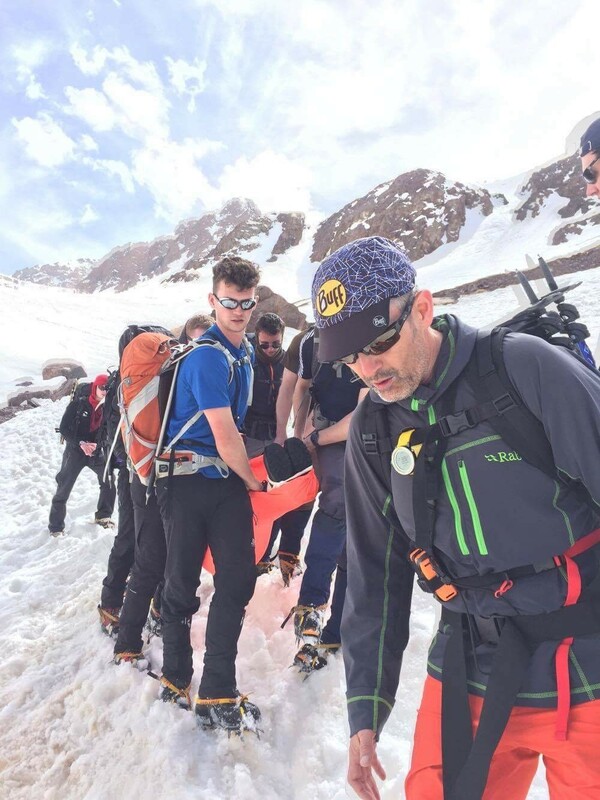 The group had certainly developed to be an effective team over the expedition and our rescue had allowed us to put our training and teamwork into practice when it really mattered. We will all remember the friendliness of the local Berber peopled and the respect we have for their very different culture and way of life. Our thanks go to the Ulysses Trust for their generous support of this expedition.